CloudHubs, Communication Hubs, AppHubs...what are they, and why do you need them? As enterprises shift to a "cloud-first" environment, legacy WAN architectures, largely those relying on MPLS, are growing obsolete. Data center resources should be hosted where the applications are - in the cloud. A CloudHub architecture enables better application performance, reduced latency, infrastructure agility, and more. 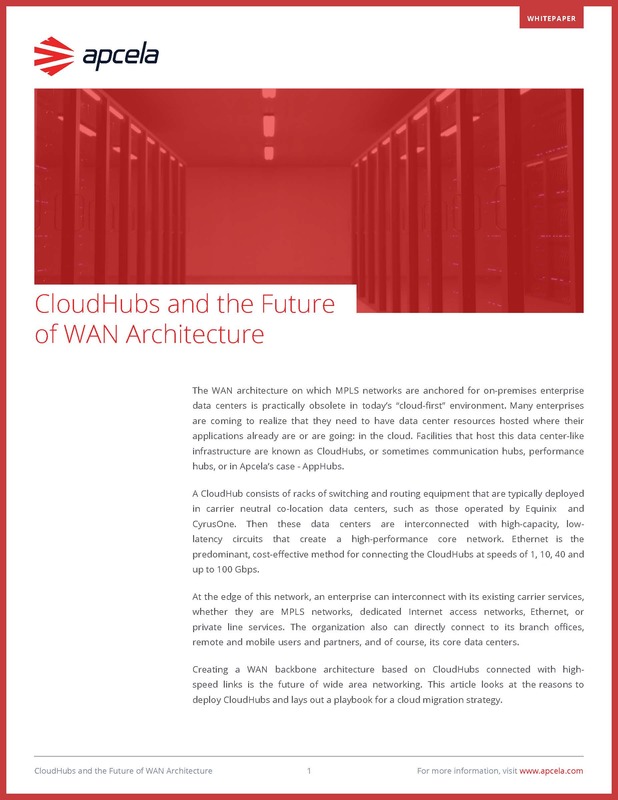 Read Apcela's white paper on the future of WAN architecture to learn more about CloudHubs, and to access a proven playbook for a cloud migration strategy. Apcela is a provider of global, high performance network and application delivery solutions. We deliver solutions that optimize the performance and security of distributed applications and eliminate the network as an obstacle to business success.